As I mentioned earlier this weekend, the other theoretical background I particularly liked was that of constructive alignment, so – I shall be re-reading this to refresh my memory:- John Biggs’ ‘Aligning Teaching for Constructing Learning’. For my proposed lesson plans, ILOs (Intended Learning Outcomes), the place of Assessment, and choosing TLAs (Teaching and Learning Activities), will all be central to the process. There are four essential requirements for my forthcoming week, as far as the PGCert is concerned: see the Scottish music course handbook; mug up some theory; decide what is to be shared with the students and what they need to learn from it; and write two lesson plans. Do-able? I’ll soon find out! So, here we have a conundrum. Do I blog about my daytime activities, or my evening ones? By day? I’ve just spent two days with my research head in the eighteenth century, but with one eye looking at digital possibilities for future developments. I’d like to crunch a lot of data (“big data”) from nine or so different libraries, so that I can essentially stir it up and see what comes out of it. At the moment I’m just looking at catalogues and websites to see how much of the data is available online in the first place. So … I see that I warmed to constructive alignment as a pedagogy. I had the chance to acquire some new textbooks published by Sage, a few months ago, so I got a shiny new book for just this purpose:- Constructivist Learning Design: Key Questions for Teaching to Standards, by George W. Gagnon, Jr., and Michelle Collay (2006). I also got a new book for the Library, not so long ago:- How we Learn: the Surprising Truth about When, Where, and Why it Happens, by Benedict Carey (2014). More reading for me! I’ll spend a bit of time reading, then get back to my teaching remit, to give the reading a chance to influence my practice. Year 1. A session exploring historic examples of tradition in performance. Year 2. A session exploring nationalism in traditional music (historical examples/ perspectives). First things first – if I am going to flip the classroom, then I don’t get to stand up in front and lecture for an hour!! So, how to get a group of students that I have barely met, to engage with the topic and its concepts? That’s my challenge. Will Video Kill the Lecturing Star? It’s about setting assignments to watch short video clips and answer questions – AS WELL AS doing the required reading. Interesting. I must admit I need to clear up in my own mind where “outreach” becomes “impact”. If outreach is done by me, then impact is measured by how much interest my work arouses? 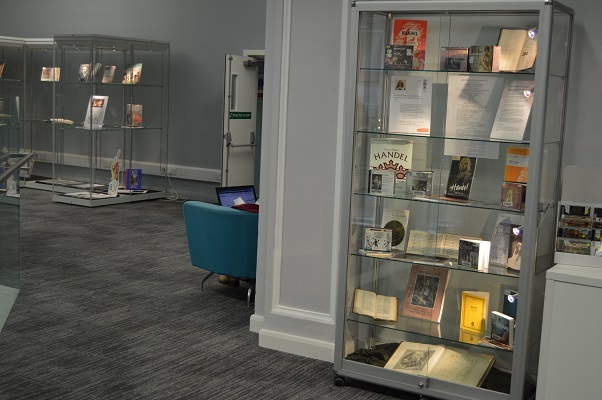 Anyway, in September this year, I talked about the Wighton and Jimmy Shand collections in Dundee Central Library. In October, I talked about both my recently-finished involvement in the Bass Culture project, and my own new project, ‘Claimed from Stationers’ Hall’, at one of the Royal Conservatoire of Scotland Exchange Talks. I also talked about the First Edinburgh Musical Festival on the occasion of its Bicentenary, and that took place in Edinburgh Public Library. This month – today, in fact – I talked about the website arising from the Bass Culture project – hms.scot – which has now been launched in beta version pending the proper launch in February next year. ‘Fiddle Books by the Dozen’ was the name of today’s talk at the Scots Fiddle Festival. The audience was of modest size, but certainly showed interest. If there are enough visits to hms.scot, then we’ll know there has been impact. Please take a look! There are over 220 fiddle books listed, and 22 of them have been indexed and fully digitised – well worth a look. I won’t post my talk here – I’ve agreed to write a piece for Box and Fiddle – but I can share the slides. Please Click Here. Technically, tomorrow I become a student again as I join the rest of my cohort on the PG Certificate in Teaching and Learning in the Performing Arts. It’s a bit disconcerting to reflect that, had I had the courage to aim for a career in academia at the age of 24, I wouldn’t have become a librarian, might not have ended up in South Tyneside, and wouldn’t be here in Glasgow now. Some of us take longer than others to realise where we ought to be, career-wise. Still, tomorrow being Tuesday, it’s also the first of my two research days each week. I shall haul my notes and my learned tomes to work, and think scholarly thoughts until home-time. I must confess I have a most unhealthy enthusiasm for Kassler’s Music Entries at Stationers’ Hall book, probably because bibliographies satisfy the inner librarian and inner musicologist in equal measure! And then there’s the pleasure of recognising names and publishers from other research I’ve already done. My invisible friends are the ghosts of musicians, publishers and booksellers from the Georgian and Regency eras – I love them all! 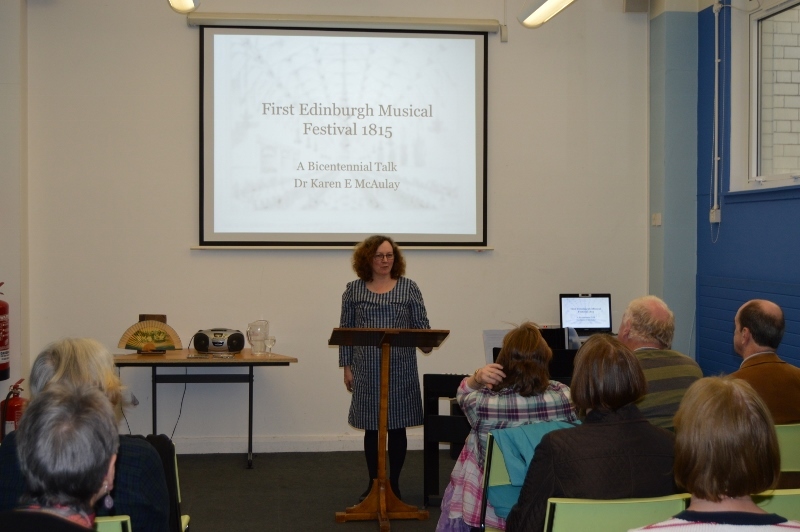 Last Friday saw me giving a bicentennial talk about the First Edinburgh Musical Festival, at Edinburgh Central Library. This was a collaboration between myself, Bronwen and Anne, the librarians responsible for music services there. They handled the ticketing and the venue, and also mounted a display of relevant publications. I did my research in Glasgow and travelled through to Edinburgh for the day, to give my talk. Edinburgh historian Eleanor Harris kindly shared her transcriptions of Caledonian Mercury columns with me, and I drew upon these as well as the festival report written by a youthful George Farquhar Graham. Almut, our counterpart in the National Library of Scotland, put on a complementary exhibition on her side of George IV Bridge! Remarkably, the exhibitions had picked out different material for display, so the audience was encouraged to take a look at both. As I mentioned before, by sheer good luck, I was able to go on a guided tour of Parliament House (the old one), the morning of my talk. It made all the difference to have stood in the hall and imagined it ready for the very first concert, complete with organ imported from Covent Garden for the week. 31 people attended my talk, and the feedback was very positive; astonishingly, they even liked my playing! In my 27 years in Scotland, I had never collaborated with Edinburgh Central Library before, but it was a triumphant success. I do hope we get to repeat the experiment again some time!